Tickets: £10 on the door and ‘Early bird’ £7.00. Please, enquire from Old Police Station, Admin: 0151 7287884. 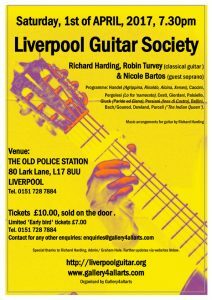 An inspirational ‘back in time’ music voyage bringing to the audience a fascinating juxtaposition of baroque, romantic 17th century and early music selections for soprano voice, next to brand new guitar arrangements, from Richard Harding, composer and director of Liverpool Guitar Society. Meet members of Liverpool Guitar Society in a showcase featuring a collection of delightful and inspirational Italian romantic arias and songs, focused around the theme of love, beauty and drama, generally, reflecting aspects of the human condition and artistically sung bell canto by Bartos, in a unique manner full of expressivity, her bright soprano communicating authentic feelings and singing right from her soul. With a programme and repertoire chosen by the singer you will listen to selections from Handel (Aggrippina, Xerxes, Rinaldo, Alcina ), Bellini (Vaga Lun, arietta), Pergolesi (Ogni penna piu spietata/ Lo frate ’namorato), Caccini (Intorno al idol mio/Orontea), Persiani (Cari giorni – Ines di Castro), Gluck (Paride ed Elena), Giordani, Paisiello, Dowland (The First Booke of Songes or Ayres), Purcell (The Indian Queen). An event promising to be as soothing as wonderfully entertaining and suitable for al family.